Since Oracle certifications are tied to version numbers, they periodically announce the retirements of old exams. This is reasonable. They even publish a page of retiring exams and include this fact on the all exams list. However, this is incomplete and currently inconsistent. 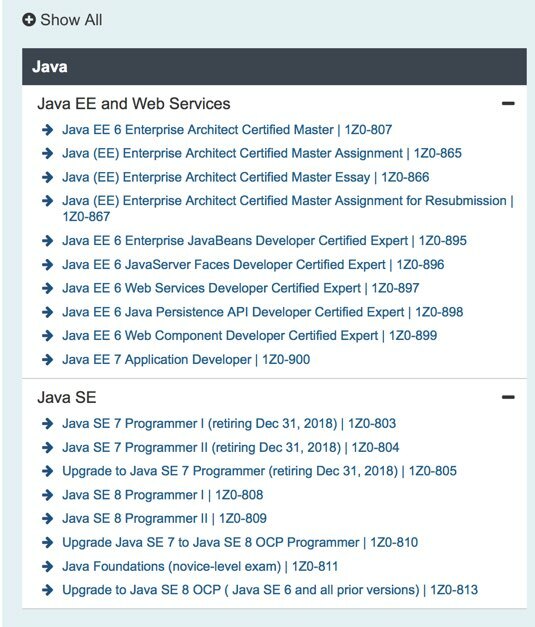 The retiring exam page currently lists the Java 7 certs, but not the Java EE 6 certs. On the other hand, if you go to the page for a Java EE cert that is retiring, it says in the title that the exam is retiring. On the third hand, if you go to a page for a Java 7 cert that is retiring, it does not say anywhere on that page that it is retiring. I hope Oracle fixes this. It’s confusing! CodeRanch has been using SVN for a long time for the forum software. It’s high time to switch. We have just over 20 projects in our one SVN repository. Most are small/inactive so it wouldn’t be terrible to have the history in only the biggest project. However, I wanted to try to do it “right” and migrate the history of each project into a separate git repository. A couple moderators use GitLab professionally and have had good experiences with it. Migrating a remote repository involves a large number of network roundtrips. It’s far faster to export the SVN repository/database to a local dump file. Starting with SVN 1.7, this is a completely client side operation. This hit or miss approach works (slowly) because “git svn clone” complains if it encounters an author that isn’t defined. This let me go back and add that person without having to manually do a lot of analysis. Luckily, “git svn clone” does let you resume from where you left off. We hardly have any branches so I didn’t search for the optimal way. I used a three step procedure. I used the UNIX script from sailmaker to convert the SVN tags to Git tags. This approach leaves stray remote branches. They are visible using git branch -a, but not in the GitLab UI. They seem to go away if you clone the repository to another directory so I’m thinking they are local branches and were never pushed to GitLab. We have 396 tags for the forum software and zero tags for all our other projects. I tried migrating our entire repository including tags using “git svn clone.” It took too long. 9K+ commits 800MB, 300+ tags is really slow. After running (against my local SVN) for over 24 hours, it was less than half done. I realized the bulk of the time was going to migrating tags. So I did the “git svn clone” migration for just the trunk and branches. Then I dealt with the tags using a script. Finally, I was ready to add gitlab as a remote. Again, I migrated the branches manually since there weren’t a lot. Then I dealt with the tags. But that warrants a separate blog post. There’s a number of tools called svn2git. The most promising one looks like this one per this post. I didn’t try it because I was almost done at that point. Also, it requires you to build from source. Wasn’t worth the effort. https://www.getdonedone.com/converting-5-year-old-repository-subversion-git/ – uses master/trunk/branches structure – why want that? To review, this repository has just under ten thousand commits and just under 400 tags. Migrating with “git svn clone” would have taken over 48 hours. Since the majority of the time was going to migrating the tags, I decided to migrate just the trunk/branches and then re-create the tags. After all they are just labels. This post describes the procedure. This is good. It lets me map SVN commits (ex: 8848) to Git has (9a30da). This means it is possible to create the tags with a script. Some “light googling” didn’t find such a script so I wrote my own. This is easy. Go to https://<svn url>/svn/tags/ in a browser and it gives you such a list. Just copy this to a file. My file had 396 lines in it. But copy/paste doesn’t charge per line so this was ok! echo "commit ($1) for tag name ($2) not found. Aborting. Please check git repo or remove this tag from the input"
echo "1) Path to git repo"
echo "2) name of file containing tags"
echo "3) url to svn"
echo "git tag -a "$tag_name_without_trailing_slash" -m \"re-creating tag for SVN @$svn_revision commit\" $git_commit"